Sleepy Hollow Books, 9780982454251, 175pp. 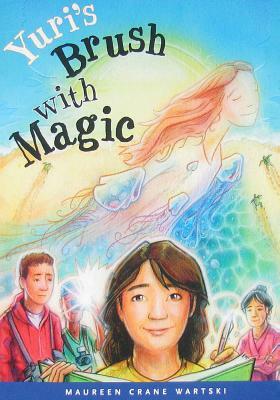 Yuri's Brush with Magic by Maureen Wartski is an intelligent novel for preadolescents. Featuring Japanese folktales told in a contemporary setting, Wartski's adventure novel explores the complexity of family relationships and how generations-old misunderstandings can cause rifts that affect the children--and how to heal those rifts. Nine-year-old Tammy is worried--her mother lies in a coma and her father is overwhelmed. Out of nowhere her great-aunt, "Mean Yuri" Hamada, appears to whisk Tammy and her older brother, Ken, off to Emerald Isle. Ken plots to return home by impeding Yuri's resolve with acts of extreme brattiness. But Tammy is captivated by Yuri's storytelling, the way her brush brings old Japanese folktales to life on her canvas, her aunt's past. She's as concerned about a buried nest of loggerhead turtle that may not hatch. Wartski skillfully blends these subplots with themes of renewal and transformation.